Shortly after the end of the 2018 NASCAR Cup Series season – a season in which Jimmie Johnson was not only not a race-winner but, crazily, not even consistently competitive – a colleague and I both wondered during a phone conversation if perhaps the best stock car driver in history was done for. Would NASCAR proceed onward with three drivers tied at seven in terms of Cup championships well into the foreseeable future? We came to the conclusion of: perhaps. Johnson was, after all, 43 years old. Gray hairs had worked their way into his closely cropped beard. His last title came in 2016 and his top-five-finishes numbers were plummeting. Worse, his Hendrick Motorsports team seemed baffled when it came to something it had done without peer for a quarter of a century – figure out how to make stock cars go really fast. 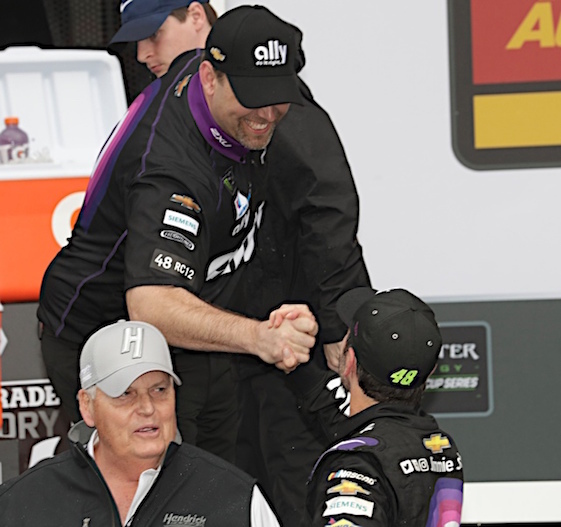 So toothless was Johnson a season ago that the decision was made to separate him from Chad Knaus, the crew chief with whom he won the seven championships – a distinction he shares with legends Richard Petty and Dale Earnhardt. After the season ended, Johnson’s reflections were not exactly optimism infused. “2018 was probably my most difficult year since I’ve been with Hendrick Motorsports,” Johnson said. “Probably very close to the most difficult year I’ve had in my professional career. But all that said, I feel like I learned more from those challenging moments. Those are often the words of fearful competitors. But, it turns out the conclusion of my colleague and mine should have been: Perhaps not. 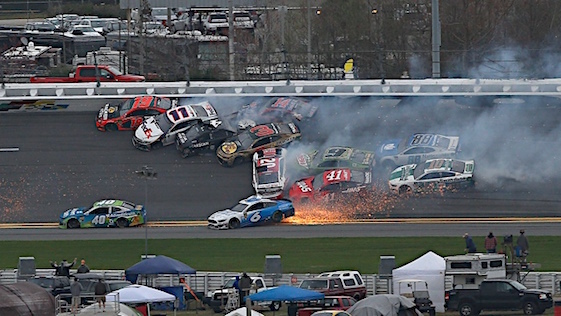 This weekend, the opening weekend of Speedweeks 2019, has been extremely hopeful for Johnson, his team and his fans. Forget the fact that Johnson won Sunday’s uber-bizarre Clash exhibition race – his victory got liberal assists from a mistake by journeyman driver Paul Menard and on-and-off rain showers that thankfully ended the boring show 16 laps before its scheduled 75 laps were completed. Johnson and HMS both served notice over the weekend that 2018 may well have been an aberration. Simple teething pains on the then-new Chevrolet Camaro ZL1. In practices for the Clash and for the 500 last weekend, Hendrick cars logged laps that were among the fastest on the track. 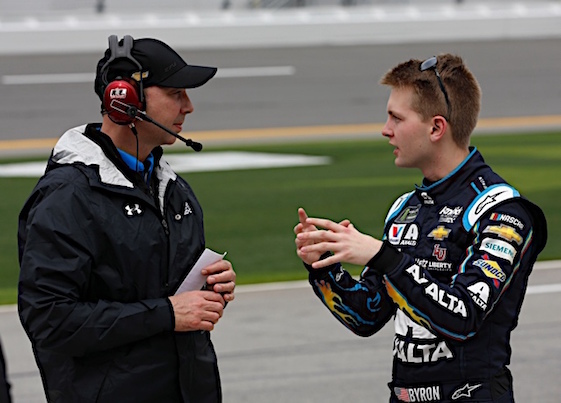 Then on Sunday, Hendrick’s four drivers captured the top four spots in qualifying for the 500 with 21-year-old William Byron on pole, Alex Bowman second, Johnson third and Chase Elliott fourth fastest. They were the only four drivers who topped the 193 mph mark. But wait, there’s more. Johnson showed that his post-season split with Knaus is working out well for both driver and crew chief. Knaus’ new driver is on the pole for the 500 and Johnson’s new crew chief, Kevin Meendering, got his driver to victory lane in the Clash. It’s surely good news for an organization whose pride took a bit of a beating last season. “I’m so happy for William – and for all our guys,” team owner Rick Hendrick said . “We’re just pumped. This is a great way to start the year … this is ‘the deal’ to start on the pole at Daytona. The true importance of Hendrick’s showing on the first weekend of Speedweeks will not be known for a couple more weeks. Daytona is plate track. The Cup races there are oddballs because of the unique rules packages that NASCAR slaps on them. The racing world will get its first real look at the progress Hendrick’s team has made over the off season when the cars take to the 1.5-mile Atlanta Motor Speedway track in two weeks. Yep, success at any level tops disappointment at all levels. “You know, points races are different, but we’ll take this,” Johnson said. “You know, we still need a points race win to say we’ve been back to Victory Lane. It’s a great first step today to get first reps with Kevin, a lot of new members on the team, to bring Ally into the sport with a victory and qualifying third. Just a really big day for the 48 team, and just building the confidence that we’re going to need to carry into the season.